The right moment finally occurred at 5pm, where the wind was weaker but we were losing daylight. The divers decided to go in regardless. After two cancelled dives they felt the need to be in the water. The Somov`s seamen hoisted the rubber boat down and they left for their dive. The visibility was close to zero and dusk arrived just when they began their dive, nonetheless they felt free in the water, in their element. It was somewhat scary because they could barely see the rope on their way down nor the surface on their way up, as the water was murky and dark without sun or moonlight to orient them. Thankfully they had a lanyard to keep them linked to the rope. No onewants to be lost in the middle of the East Siberian Sea! No doubt that this experience tested their courage and mental resources. As they finished to gather their gear on the dinghy, they felt relief at seeing the Somov appear in the night. After such a cold and dark dive, returning back to the lightened and warm Somov was incredibly reassuring. Somov, Somov, our Home Sweet Home in the Russian Arctic. That night, the clear sky held a beautiful surprise in store for us: the Northern Lights! Many of us ran onto the deck to take in the Aurora Borealis. The lights appeared between 10 and 11pm which was the same time period De Long reported in his journal in September of 1879 about 140 years before us. They were as surprised to see us as we them. Our two polar bodyguards, did their job perfectly and managed to divert them without using their rifles. A red flare was enough to make them run away. The divers, on the other hand, entered the water slowly when they saw three walruses swimming towards them. Aurora, Alexey, and Nikolai decided to stay together, ready to go back to the shore if the walruses became aggressive. Wildlife is wildlife. Marine mammals have to be approached in a very slow and respectful way. You don't go to them, you let them approach you. 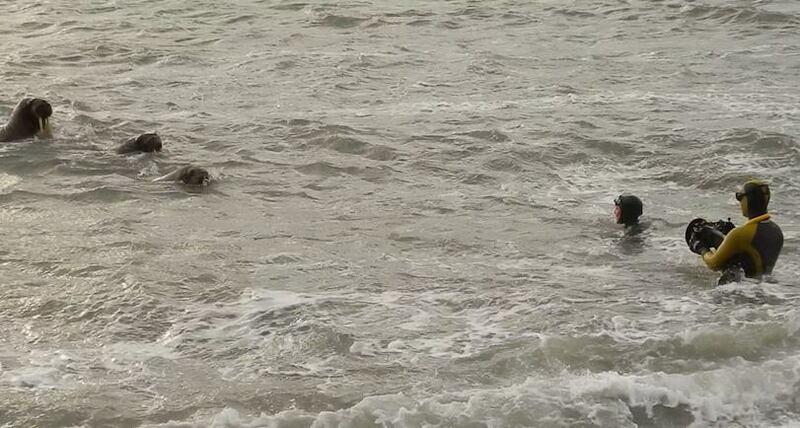 The free divers awaited for the reaction of the two walruses that were passing by. A large male came quickly towards us and we became uncomfortable when they saw the length of his two ivory teeth. They started to swim back to let the walrus know that his intimidation tactics were working and that they were not predators. This big male was probably the master of the colony... After a couple of minutes, the animal understood that we were not a threat and other walruses came to us showing what we took as pure curiosity. At that moment the divers felt emotional to possibly be the first human beings daring to swim with walruses in Arctic. Meanwhile, on the beach, Alexey Tikhonov and Eric Crubezy and our two photographers were exploring, trying to find any artifacts, relics, or bones.